No one wants to get stuck in the rain without one of the best travel umbrellas to keep them and their belongings dry. A travel umbrella is an umbrella that you can transport easily and is sturdy enough to withstand the worst of wind and rain storms. The best travel umbrellas are compact enough to fit in suitcases, travel backpacks, or even travel purses. Travel umbrellas are great for both adventures and everyday life. Regardless of where you use them, a good travel umbrella will save you from being caught unprepared if the weather is unexpectedly wet. Here are the 5 best travel umbrellas and how to pick the best one for your needs. One of the best travel umbrellas is the Repel Windproof Travel Umbrella. While other umbrella’s shine in specific areas, the Repel gives you just about everything you need. It’s compact and lightweight so you can fit it wherever you need to. It weighs only a pound and measures 11.5 inches long. It is also built to withstand water and strong gusts of wind during a storm. It has nine ribs rather than the typical six to eight that most travel umbrellas have. The umbrella also has a Teflon coating, so it repels the most substantial rain and dries rapidly. The Repel Windproof Travel Umbrella is one of the best travel umbrellas because it’s sturdy, super comfortable to carry and opens and closes quickly. This umbrella is ideal if you’re traveling to a city like London or Seattle or if you reside in one. Rubberized handle: The handle is ergonomic, slip-proof, and rubberized to make it comfortable to carry. Lifetime replacement guarantee: The umbrella will be replaced with the lifetime warranty if anything goes wrong with the umbrella. Teflon coating: This technology makes it so that your umbrella is weatherproof and dries quickly. Wind resistance: This umbrella is made with nine ribs to withstand strong gusts of wind. Most small umbrellas have six to eight aluminum ribs, but Repel’s has more and flexible reinforced fiberglass. Small handle: The small handle may not fit comfortably in larger hands. The best travel umbrellas should be as compact as possible. You’ll need for it to fit in the smallest pockets or travel purses so that you can fit in the rest of your belongings. 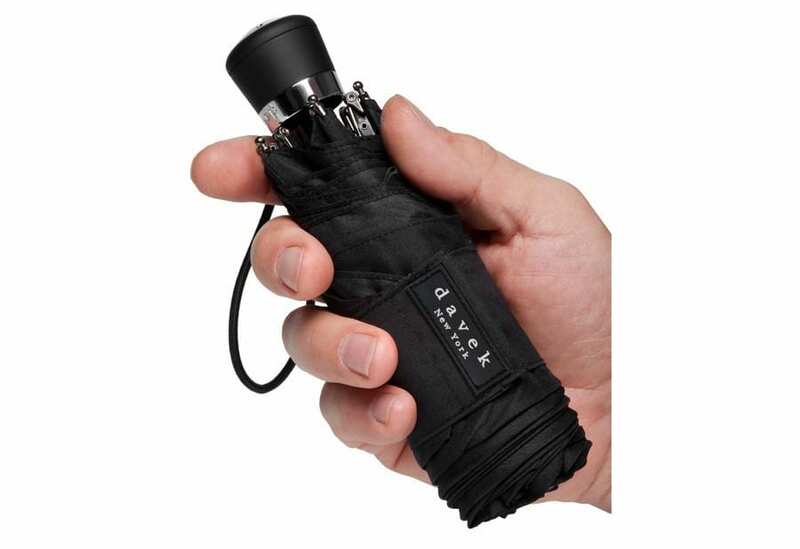 The Davek Mini Compact is one of the smallest umbrellas out there that is also excellent at repelling the rain. When closed, it is only seven inches long. The Davek can fit in most people’s pockets. This compact folding umbrella can withstand powerful storms and keep you dry. Color options: This traveling umbrella has a color option for everyone. Choose from black, cocoa, deep red, kelly green, pink, plum, royal blue, turquoise, or yellow. High quality: This is one of the best umbrellas on the market. The company has 12 points of inspection to make sure the high-grade steel and fiberglass frame is the highest quality. The company wants you to be able to make a long-term commitment instead of buying new umbrellas every year. Lightweight and compact: This umbrella is small enough to go almost anywhere with you without being noticeable. It measures less than seven inches when it’s closed. Loss protection: Every umbrella comes with a number that you can use to get a replacement at 50% off if you lose your umbrella. Wind resistant: The patented frame is reinforced with zinc allow, fiberglass, and steel to prevent the umbrella from breaking even with the strongest gusts of wind. Higher price: This umbrella costs more than most travel umbrellas. However, the quality is higher than most too. Small size: The size may be too small for some people when the umbrella is open. The Lewis N Clark Travel Umbrella is the perfect travel companion. It has all the bells and whistles, and it won’t take up too much weight in your bag. At a solid 10 ounces, this is the best travel umbrella for those worried about luggage weight. In addition to the lightness, it’s also durable and made to withstand torrential rain pour and gusts of wind. It’s made with quick-dry polyester and reinforced with a mildew-resistant canopy, so you don’t have to worry about it smelling or deteriorating over time. The automatic open/close button and wrist strap make this umbrella more convenient. On top of all that, this is also our budget pick as one of the most affordable travel umbrellas on the market. Compact folding umbrella design: The umbrella folds down to 11 inches but has a 38″ canopy. Lightest travel umbrella on the market: If you want something that will be easy to carry, this umbrella is an excellent option. Low price: You get an excellent traveling umbrella for a low cost. Mildew-resistant polyester material: The quick-drying material helps keep your other belongings dry and avoids the growth of mold. Weaker material: The lightweight material also means it’s a little more prone to tearing and other damage. Most small compact umbrellas have six to eight ribs, which are the metal spikes that hold the canopy together. The Bodyguard Travel Umbrella is one of the most windproof umbrellas out there because it has ten reinforced fiberglass ribs that can withstand the strongest of winds. The chances of the umbrella turning inside out during a storm are small because of the Bodyguard’s construction, and the Teflon coating will keep you dry. The best part? It also comes with a sleek leather carrier that makes this umbrella look like luxury. 10-rib build: This design makes it so the umbrella won’t be flipped around in strong winds. Automatic snap open and close function: Touch the open and close button on the ergonomic handle to expand and collapse the umbrella. Portable design: This umbrella is lightweight enough to keep in your car or bag without taking up a lot of space. Teflon coating: This fabric makes your umbrella as waterproof as possible even during downpours, and it’ll dry fast. You won’t have to worry about water in your bag. Less compact: This umbrella is slightly longer than most travel umbrellas when it’s closed. For the style-conscious travelers, Rainlax brings you a great travel umbrella with a unique design. 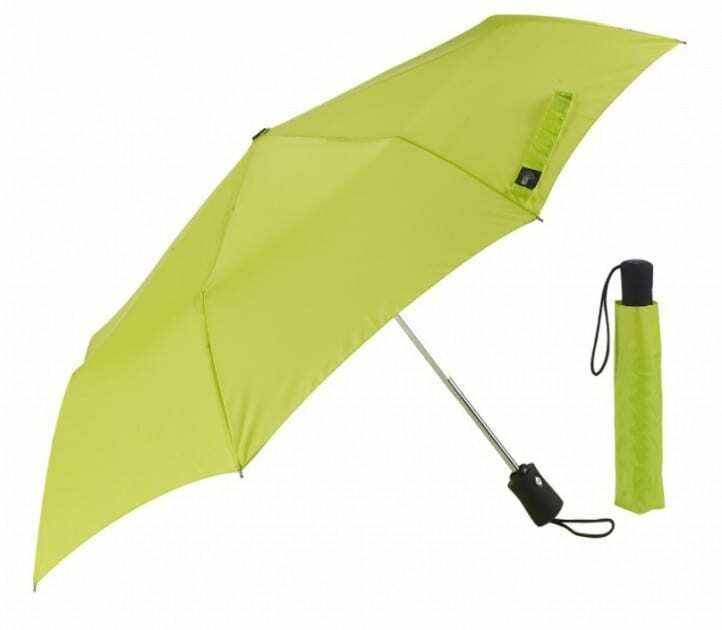 The compact umbrella is easy to carry around on your travels or even for everyday life. The stong eight-rib design can withstand a storm, and if anything happens, there is a lifetime replacement guarantee. One of the perks to this umbrella is that it can be used during a sunny day too. The canopy has UV protection to block you from those harmful rays. Overall, this is a versatile and stylish choice for a portable umbrella. Comfortable grip: The handle is soft so that it will be easy to carry even if you hold the umbrella for a long time. Lifetime replacement guarantee: The umbrella is automatically in a warranty program. If anything goes wrong, you’ll be sent a new one for free. Many stylish designs: Want more than basic black? 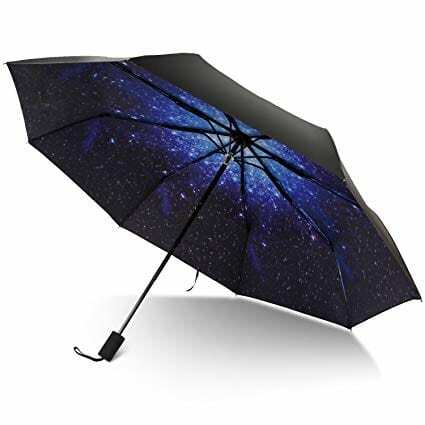 You can choose a pattern that suits your personality with this umbrella. Travel sized: This umbrella is 10.6 inches when it’s fully closed. UPF coating: You’ll get 50+ UPF protection. 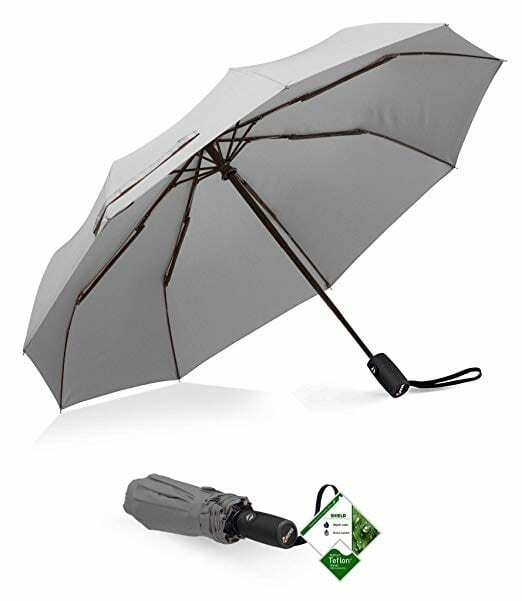 Manual umbrella: This device doesn’t have a button to open or close it automatically. Picture this. You’re enjoying a nice day out on the town and get caught in an unexpected rainstorm with no umbrella. Or, you’re out sightseeing in a new city when a windy rainstorm hits, so you take out your umbrella only for it to fumble under the power of the wind. Both situations are unfortunate. However, you can avoid both by having a good quality travel umbrella. You’d think that more people would have a travel umbrella handy, but many people find umbrellas a nuisance to carry around. Some people believe they are a waste of money after buying too many shoddy umbrellas. But no one wants to get caught in the rain. Investing in one of the best travel umbrellas will save a world of pain. Portable umbrellas should be on all packing lists. Here are the key things to look for in an umbrella. There is no point in spending money on an umbrella if it’s going to fall apart after only a few uses. Most manufacturers will claim their products are durable, but not umbrellas live up to those claims. 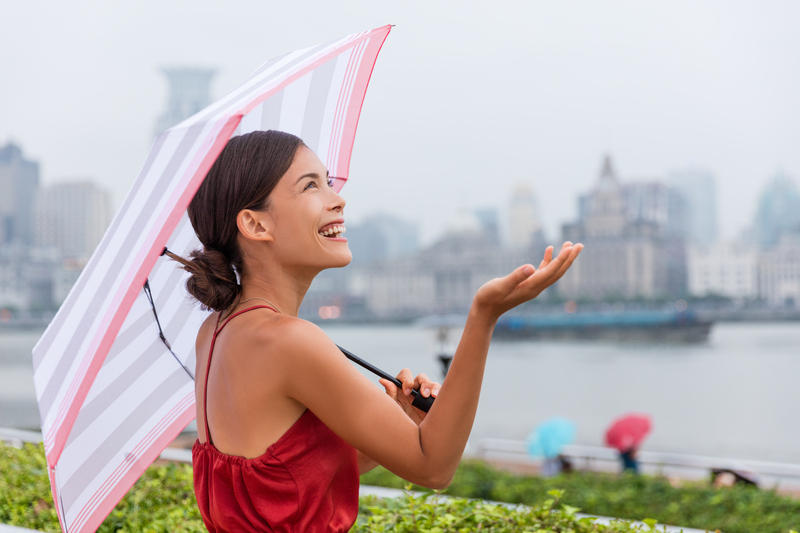 Check product reviews and be familiar with typical portable umbrellas so that you know what to look for in materials, number of ribs, and size. In general, a good travel umbrella will last longer if it’s made with quality materials and you use it correctly. If your umbrella does malfunction, most of our picks for best travel umbrellas offer warranty programs. Not all umbrellas are created equally, although they all set out to do the same thing. When shopping for a good travel umbrella, find one that will protect you against the elements. The protection of an umbrella is a combination of water-resistance and windproof technology. 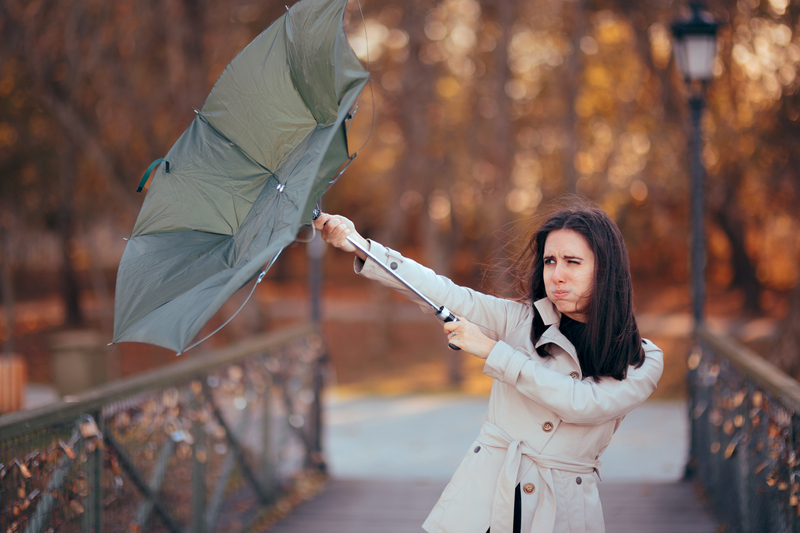 If your umbrella isn’t sturdy enough, it will flip inside out during a bad storm, leaving you wet and in need of a new umbrella. 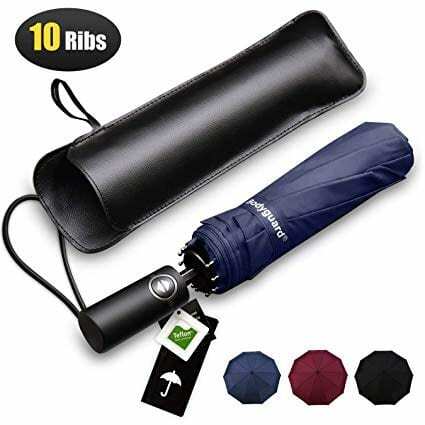 Look for portable umbrellas with 8-10 ribs if you’re traveling to a place with strong winds or if you live in a city like Chicago, where winds regularly reach up to 50 MPH. Also, pay attention to how quickly your umbrella will dry so that you can protect your belongings. There’s nothing more frustrating than sticking a wet umbrella back into your bag when it’s wet. With fabric like a quicky-dry polyester or Teflon coating, the umbrella will dry quickly after use. You won’t need to worry about it ruining the rest of your things. When it comes to travel products, size and weight are some of the essential aspects. A bulky travel umbrella won’t fit in your business backpack or will take too much room in your carry-on, so you need a compact umbrella. On our list of the best travel umbrellas, you’ll find umbrellas ranging from 10 ounces to around 1 lb. Pick an umbrella that is a mix of lightweight materials and enough strength to stand up to wind and rain. Also, pay attention to how long the umbrellas is when it’s open and closed. If an umbrella is too long when closed, it won’t be as portable. If the metal shaft is too short, you run the risk of it not being big enough when it’s extended. Look for a 40″ canopy when the umbrella is open. Most adults need this size, or they might not be able to cover themselves and any backpack or other items they’re carrying. 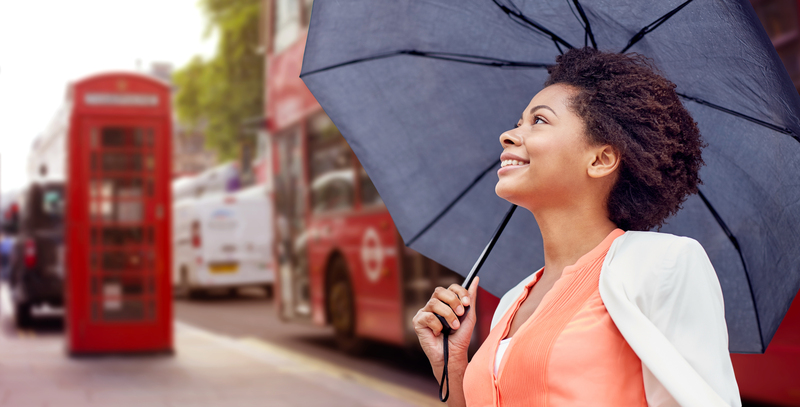 Next time you’re thinking about the essential things you need in your carry-on or what destination you’ll visit next, don’t forget to bring a sturdy travel umbrella. 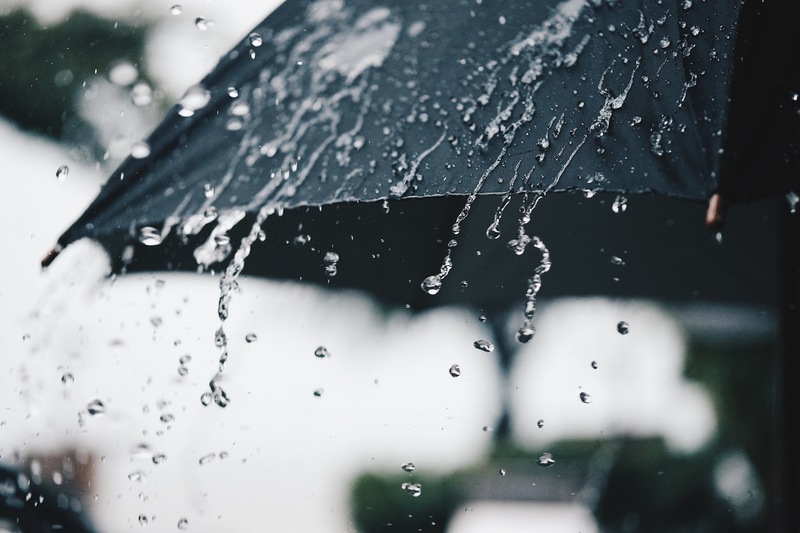 Use this guide and our top picks to find an umbrella that will keep you safe and dry from the elements and be the perfect travel accessory.